New to our rental program, this beautifully decorated two-bedroom cottage is located in the desirable and conveniently located Arrowhead neighborhood. 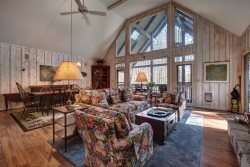 It's efficient design offers a spacious master suite on main level, vaulted great room with floor to ceiling dry stacked stone fireplace, and a cozy dining area to the right of the great room. An additional full bath on the main level allows for overflow guests. The second suite located upstairs is spacious and charming. Enjoy sitting in front of warm fireplace in the living room or on the spacious screened porch. Lush landscaping throughout surround the cottage and the lovely chimney garden provides a central gathering place for family and friends. A single flat loop road around the community is perfect for exercise dog walking. NOTE: Requires minimum of 7 nights.